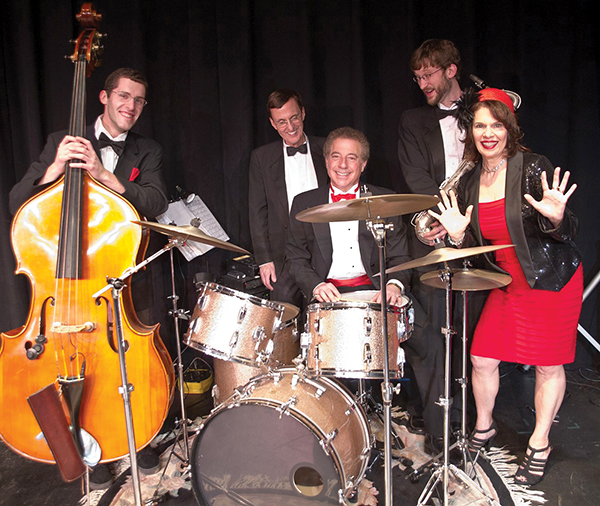 Hildy Grossman and the Follen Angels will perform at Watertown fundraiser on April 5. MARCH 29, 2018 – The ability to sing is a gift many take for granted. Sadly, hundreds of thousands of people lose this talent because of lung cancer, a scourge that is responsible for more deaths than any other type of cancer. On April 5, the research funding organization Upstage Lung Cancer (upstagelungcancer.org) will host “I Got Rhythm” at the Mosesian Center for the Arts in Watertown featuring the music of Cole Porter and George and Ira Gershwin. Created by local doctor, performer, and lung cancer survivor Hildy Grossman, Upstage has been producing fund-raising shows like this one for years and each performance gets bigger and better. Grossman’s jazz and cabaret group, the Follen Angels, will be joined by Northeastern University’s a cappella group, the Unisons. The evening also will feature presentations by Dr. Jacob Sands, a leading lung cancer clinician and researcher at Dana-Farber Cancer Institute; and Steven Young, president and chief operating officer of the Addario Lung Cancer Medical Institute, a California-based research consortium. When asked how the event came to be, Grossman explains that while many great songs start at the top, her story starts at the bottom. “In the fall of 2006, I bought a pair of green sandals with a cute kitten heel,” she recalled. While the shoes looked great, they did not function so well. In fact, the first time she wore them, Grossman slipped down the stairs and ended up in the hospital. While her back was fine, the MRI picked up a pair of tumors on Grossman’s lung. She underwent surgery three weeks later. Though her cancer has been in remission since, she knows how scary such a diagnosis can be and how many people face them every day. “Most people would say there’s nothing fortunate about getting lung cancer,” Grossman mused. “In fact, it was horrifying, shocking, and upsetting to wrestle with the diagnosis and try to figure out what it meant for my life and life expectancy.” Even so, she was able to “come to terms with it” and, in the process, to become more aware of how fortunate she was. Meanwhile, Grossman knew there was a large audience for her to support. That is how Grossman was inspired to put her medical connections and her musical talents to work to help others in need. Music can be highly therapeutic, even for those who are not facing cancer themselves. That is why Grossman has loved producing shows for Upstage and using song to raise awareness and funds for the fight against lung cancer. “In October 2008, we had our first fund-raiser,” Grossman said, recalling a concert in a private home that included performances by the Follen Angels and a presentation by Mass General’s Dr. Jennifer Temel. “The event was a tremendous success,” Grossman recalled. Since then, Upstage shows have featured the music of everyone from Leonard Bernstein to Florenz Ziegfeld and have raised thousands of dollars for vital research. The show begins at 7:30 p.m. April 5 at the Mosesian center’s Black Box Theater, 321 Arsenal St., Watertown. Tickets are $25 to $250. To purchase, call 617-923-8487 or go to mosesianarts.org.